MQTT is a machine-to-machine (M2M)/”Internet of Things” connectivity protocol. It was designed as an extremely lightweight publish/subscribe messaging transport and useful for connections with remote locations where a small code footprint is required and/or network bandwidth is at a premium. For example, it has been used in sensors communicating to a broker via satellite link, over occasional dial-up connections with healthcare providers, and in a range of home automation and small device scenarios. 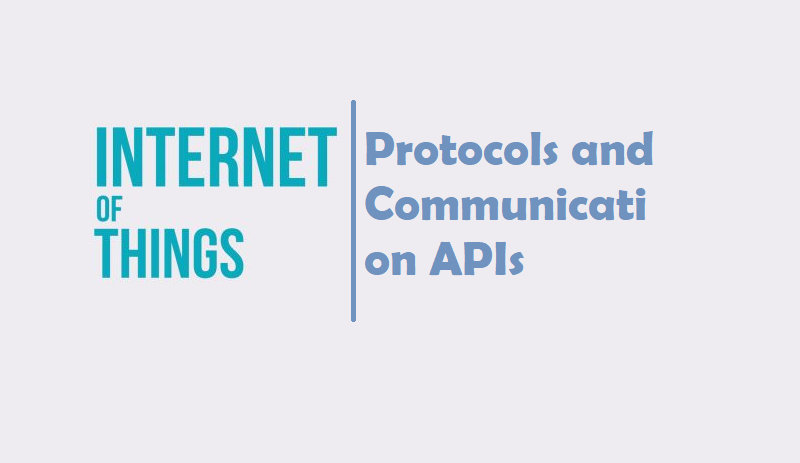 The AMQP – IoT protocols consist of a hard and fast of components that route and save messages within a broker carrier, with a set of policies for wiring the components together. The AMQP protocol enables patron programs to talk to the dealer and engage with the AMQP model. AMQP has the following three additives, which might link into processing chains in the server to create the favored capability. Bluetooth is a global 2.4 GHz personal area network for short-range wireless communication. Device-to-device file transfers, wireless speakers, and wireless headsets are often enabled with Bluetooth. BLE is a version of Bluetooth designed for lower-powered devices that use less data. To conserve power, BLE remains in sleep mode except when a connection is initiated. This makes it ideal for wearable fitness trackers and health monitors. (Narrow-Band IoT) A technology being standardized by the 3GPP standards bodyThe ZigBee protocol uses the 802.15.4 standard and operates in the 2.4 GHz frequency range with 250 kbps. The maximum number of nodes in the network is 1024 with a range up to 200 meter. ZigBee can use 128 bit AES encryption. Z-Wave is a sub-GHz mesh network protocol, and is a proprietary stack. It operates in the sub-1GHz band and is impervious to interference from WiFi and other wireless technologies in the 2.4-GHz range such as Bluetooth or ZigBee. It’s often used for security systems, home automation, and lighting controls. 6LoWPAN is an acronym of IPv6 over Low power Wireless Personal Area Networks. It is an adaption layer for IPv6 over IEEE802.15.4 links. This protocol operates only in the 2.4 GHz frequency range with 250 kbps transfer rate. IPv6, is an Internet Layer protocol for packet-switched internetworking and provides end-to-end datagram transmission across multiple IP networks. It is an open IoT network protocol like ZigBee, and it is primarily used for home and building automation. Built on open standards and IPv6 technology with 6LoWPAN as its foundation. You could think of it as Google’s version of ZigBee. You can actually use some of the same chips for Thread and ZigBee, because they’re both based on 802.15.4. Designed specifically for low data rate, long-range sensors and controllers, 802.11ah is far more IoT-centric than many other WiFi counterparts. 2G is the “old-school” TDMA (usually) cellular protocol. ATMs and old alarm systems used this— and in most parts of the world it is phased out or in the process of being phased out. 3G was the first “high speed” cellular network, and is a name that refers to a number of technologies that meet IMT-2000 standards. 4G is the generation of cellular standards that followed 3G, and is what most people use today for mobile cellular data. You can use 3G and 4G for IoT devices, but the application needs a constant power source or must be able to be recharged regularly. With LTE classes, the lower the speed, the lower the amount of power they use. LTE Cat 1 and 0 are typically more suitable for IoT devices. This is the first cellular wireless protocol that was build from the ground up for IoT devices. That being said, it isn’t available yet, so how it performs remains to be seen. With LTE, it’s worth understanding that carriers typically don’t have to modify hardware for their basestations; upgrades can be done entirely through software. This really helps with infrastructure costs, because companies won’t necessarily need new cellular basestations, just new endpoint hardware. (Narrow-Band IoT) A technology being standardized by the 3GPP standards body is another way to tackle cellular M2M for low power devices. It is based on a DSSS modulation similar to the old Neul version of Weightless-W. Huawei, Ericsson, and Qualcomm are active proponents of this protocol and are involved in putting it together. Though it likely won’t be released for another five years, 5G is set to be the next generation of cellular network protocol. It’s designed for high throughput, and it will probably face the same issues as 3G and 4G in regards to IoT. NFC,is the acronym for Near Field Communication.It is a short-range high frequency wireless communication technology that enables the exchange of data between devices.It enables two electronic devices, one of which is usually a portable device such as a smartphone, to establish communication by bringing them within 4 cm (1.6 in) of each other. Radio-frequency identification (RFID) uses electromagnetic fields. RFID is not new since it has been used almost in every industry to identify and track tags attached to objects automatically. The tags stores information electronically. There are two types of RFID tags, Active and Passive. Passive tags collect energy from RFID reader’s radio waves whereas Active tags have its power source such as a battery and can operate at hundreds of meters distance from the RFID reader. RFID technology can be used in the IoT to identify objects and link them to the Internet. igfox uses free ISM band to transmit data over the very narrow spectrum. Sigfox is designed to handle low data-transfer speeds of 10 to 1,000 bps using an Ultra Narrow Band (UNB) technology. Sigfox overcomes the problem of Wi-Fi and cellular in many applications that has short Wi-Fi range, where cellular cost is high and consumes more power. Network protocol intended for wireless battery operated Things in regional, national or global network. LoRaWAN is a media access control (MAC) layer protocol designed for large-scale public networks with a single operator. It is built using Semtech’s LoRa modulation as the underlying PHY, but it is important to note that LoRa and LoRaWAN are two seperate things that are often (mistakenly) conflated. Ingenu has created something called random phase multiple access (RPMA), which uses Direct Sequence Spread Spectrum (DSSS) and is similar to code division multiple access (CDMA) cellular protocols. Before IoT was a thing, Ingenu (then OnRamp) was selling metering infrastructure that collected low power information from electricity meters. Now, it’s rebranded and is trying to become a broader player in the field (like SigFox). Weightless-N is an ultra narrowband system that is very similar to SigFox. Instead of being a complete end-to-end enclosed system, it’s made up of a network of partners. It uses differential binary phase shift keying (BPSK) in narrow frequency channels and is intended for uplink sensor data. Weightless-P is the latest Weightless technology. It offers two-way features and quality of service tiers, which we think is very important. Weightless-W is an open standard designed to operate in TV white space (TVWS) spectrum. Using TVWS is attractive in theory, because it takes advantage of good ultra high frequency (UHF) spectrum that’s not otherwise in use—but it can be quite difficult in practice. If you have a Samsung device, you probably have a radio with their protocol in it. ANT & ANT+ seem somewhat like another type of BLE system, designed to create networks that piggyback off of existing hardware. A lot of devices have ANT or ANT+ compatible chips in them, and the idea is that if you get enough of these radios added to the world, you can use them together as a mesh. DigiMesh is one of a number of proprietary mesh systems. You can learn about the differences between it and ZigBee in this white paper. MiWi is Microchip’s proprietary network protocol. It was created for short-range networks and designed to help customers reduce their products’ time to market. EnOcean is a an energy harvesting wireless technology which works in the frequencies of 868 MHz for europe and 315 MHz for North America. The transmit range goes up to 30 meter in buildings and up to 300 meter outdoor. Thus, its applications are centered around building automation, smart homes, and wireless lighting control. Dash7 is an open-source wireless network protocol with a huge RFID contract with the U.S. Department of Defense. Anyhow if you are aware of any protocols that are relevant in this context not listed here, please feel free to mention them in the comments below. I hope you like this post. Do you have any questions? Leave a comment down below! Thanks for reading. If you like this post probably you might like my next ones, so please support me by subscribing my blog.